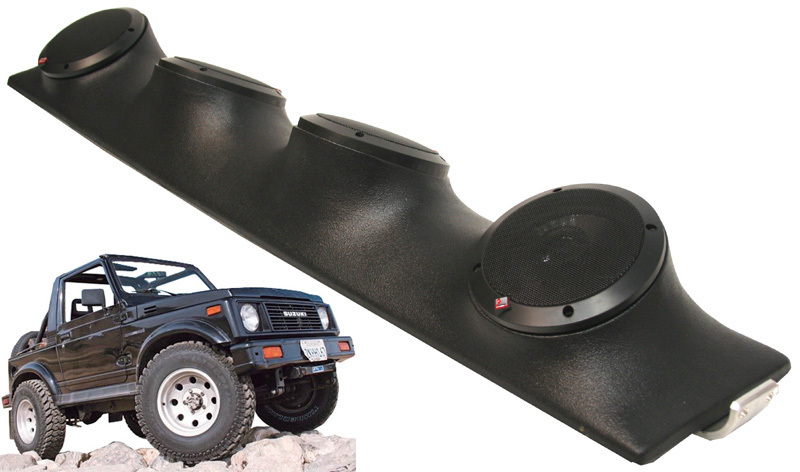 We offer a complete one stop speaker system for your Suzuki Samurai! The stereo system includes (2) pairs of Rockford P152 speakers and the UTVA-R enclosure. Just add a head unit or connect an amplifier and your ready to tackle any trail with some serious tunes. The quad pod is made from high quality LLPDE (Linear low-density polyethylene) material designed to withstand any trail ride. The UTVA-R can be either bolted directly to the top frame rails or to avoid modification to the rig you can use the included O-Clamps to securely attach the UTVA-R. The sliding brackets are adjustable from a minimum length of 49" all the way to 58 1/2" ensuring the quad pod will fit all the most popular UTV's including the your Suzuki Samurai!